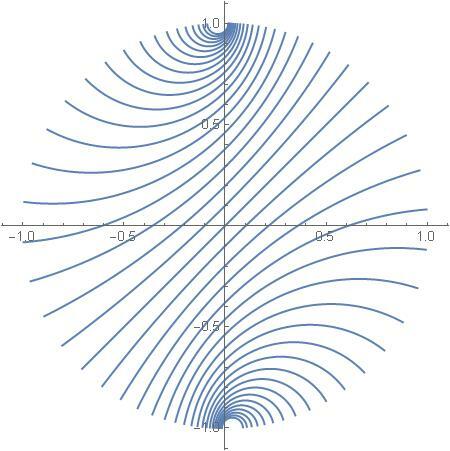 These lines are straight and they are parallel to each other, except that not in Euclidean geometry of the plane, but in the hyperbolic geometry that is based on constructions that are invariant with respect to SU(1,1) fractional linear transformations that we have met in previous notes. 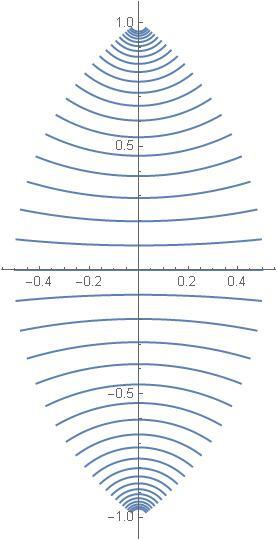 These lines are obtained by applying SU(1,1) transformations to one straight line. Therefore they are not only all straight, but they all have the same length. This observation is not, however, very revealing, because, as we will see later, in the forthcoming notes, all these lines are of infinite length. The reason that they have infinite length is that they extend to the very ends of the disk universe. The right ends are on the trajectory of passing through the point The one-parameter group leaves the vertical line invariant (even though it moves points on this line). Therefore the right ends are equidistant from the middle vertical straight line. But these points, even if they are in a constant distance from a straight line, are not on a straight line. This observation is related to the question asked by Bjab. In my reply I mentioned that straight lines of the hyperbolic geometry of the disk are segments of circles that meet the boundary at right angles. The pictures seem to support this property, but I did not give any proof of it, even a “baby proof”. It is now time to fill this hole. We will show that transformations from SU(1,1) preserve angles. Of course they would certainly preserve “hyperbolic angles”, by definition of hyperbolic geometry, but here we will show that they preserve Euclidean angles. They do not preserve Euclidean lengths, but angles they do preserve! One says: they are conformal. First we are going to simplify our task by using what we already know. We know that SU(1,1) acts on the disk transitively. We can always move the point to the origin If we are able to prove our statement for all SU(1,1) transformations and then it will immediately follow that the statement is true in general. We know that every transformation from SU(1,1) can be decomposed into U(1) rotation and a positive matrix Rotations are just Euclidean rotations about the center of the disk. They evidently preserve Euclidean angles. It is therefore enough to consider transformations. Therefore the components of the transformed vectors are equal to the components of the original vectors multiplied by the same positive factor. It follows that the angles between them are the same. Of course the proof above is a baby proof. Adults know that any holomorphic transformation preserves angles on the complex plane. Easy proof can be found here.